The Holy Qur'an (Summary): Chapter 2 Sūrah al-Baqarah (The Cow) - Why the Surah is so named ~ Islam My Ultimate Decision . Sūrah al-Fātiḥah is the opening chapter of the Holy Qur'an, which more essentially a prayer that a faithful recites in the beginning of each cycle of five daily prayers. And surely Sūrah al-Fātiḥah sums up the whole message of Allah contained in the holy book. Thereafter, then the message and commandments unfold in much details for the mankind to read, ponder and then act upon in totality and in complete submission to the only true creator of us all, Allah the Almighty. 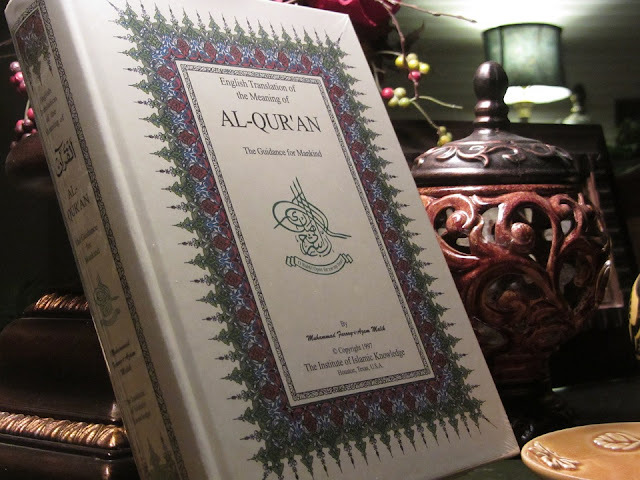 From the second chapter on, the main text and elaboration of Allah's commandments begin covering all subjects of one's way of life so that every Muslim seeks guidance from these commandments and chose the righteous path that would lead to one's salvation and forgiveness by Allah on the Day of Judgment. The five opening verses of Sūrah al-Baqarah, as translated above, give away the simple reason about the Holy Qur'an being a book of which there is no doubt and that it is for the guidance of those who are conscious of an unseen Allah, and pray to Him and spend from whatever has been provided to them. This also makes it very clear to have a belief in whatever has been revealed before this Holy scripture, like the three holy scriptures of Psalms, Torah and Bible, because only then one can be on the right path and will ultimately be successful, herein and hereafter. They said, "Call upon your Lord for us to make plain to us its colour.'' He said, "He says, `It is a yellow cow, bright in its colour, pleasing the beholders. They said, "Call upon your Lord for us to make plain to us what it is. Verily, to us all cows are alike. And surely, if Allah wills, we will be guided. He (Musa) said, "He says, `It is a cow neither trained to till the soil nor water the fields, sound, having no blemish in it.' '' They said, "Now you have brought the truth.'' So they slaughtered it though they were near to not doing it. When the piece of cow's flesh was placed on the dead man's body, he woke up, pointed towards his murderer and went back to his eternal sleep. The purpose of explaining the reference to the context has simply been to show how a faulted faith can lead to arguing with prophets of Allah in order not to do a given commandment or a solution that apparently may not seem workable. But it is Allah alone who has the absolute knowledge and has His own ways of explaining and providing solutions. Therefore when one assumes faith in Allah, it should be held without an hesitation, doubt or halfheartedness. It is only then we shall be blessed and be faithful to our Creator. The complete narration of the story also includes the will of a wealthy pious man who had a calf and asked his wife to wander it of in the wilderness. His wife hesitated and asked as to why she shroud wander off the only livestock they had for the future. The man told her to be patient and do what is the willed for Allah has His own way of rewarding those who do not hesitate for Allah commands them. After the man died and many years later when their son grew up, his mother told him about the calf and asked him to go to the jungle and find it. And the son, as pious as his father, went to jungle and prayed to Allah to return the animal. And he saw a well built, spotless young cow coming to him. The boy brought back the cow and started earning from its milk. And then the above incident happened and this was the only cow that looked exactly like as the Prophet Musa had asked the Israelites to slaughter. When the Israelites came to buy the cow, the boy refused for the price they were offering. The price was raised many times till the boy said he would not sell his cow even its skin if filled with gold. And when they even agreed, the boy said he would ask his mother and his mother readily agreed. This also explains how the farsightedness of the the old man which had the will of Allah contained in it brought wealth and prosperity to the boy and his mother. The incident appears at many sites with some variations and can be read for detailed information.